Each coxal bone is formed by three fused bones-ilium, ischium, and pubis that join at the acetabulum, the cup-shaped socket on the lateral surface. 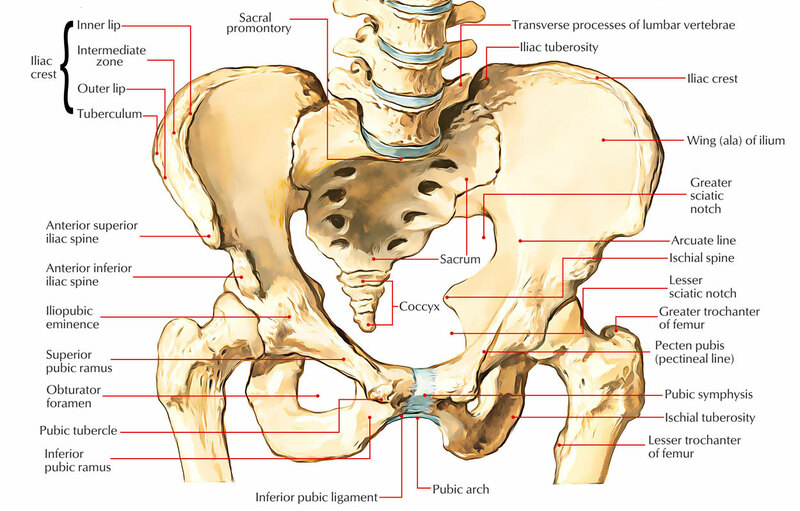 The ilium is the broad superior portion whose superior margin forms the iliac crest, the prominence of the hip. Inferior to the posterior inferior iliac spine is the greater sciatic notch, which allows the passage of blood vessels and sciatic nerve from the pelvis to the thigh. The auricular surface of each ilium joins with the sacrum to form a sacroiliac joint. The ischium forms the inferior, posterior portion of a coxal bone and supports the body when sitting. The roughened projection at the posterior, inferior angle of the ischium is the ischial tuberosity. Just superior to this tuberosity is the ischial spine, which projects medially. The distance between the left and right ischial spines in females is important during childbirth because it determines the diameter of the pelvic opening. The pubis is the inferior, anterior portion of a coxal bone. A portion of the pubis extends posteriorly to fuse with the anterior extension of the ischium. The large opening created by this junction is the obturator foramen, through which blood vessels and nerves pass into the thigh. The pubis unite anteriorly to form the pubic symphysis, where the bones are joined by a pad of fibrocartilage. When giving intramuscular injections in the hip, the region near the greater sciatic notch must be avoided to prevent possible injury to the large blood vessels and nerves in this area. Above table lists the major differences between the male and the female pelves. Compare them with the male and female pelves in and note the adaptations of the female pelvis for childbirth. The pelvic inlet, an opening superior to the pelvic cavity, is encircled by the pelvic brim, a circular line passing through the arcuate line and the superior border of the pubis. Its size and shape in females are critical to the success of the birth process. The fetus must pass through the pelvic inlet during birth. Physicians carefully measure this opening before delivery to be sure that it is of adequate size. If not, the baby is delivered via a cesarean section. In a cesarean section, a transverse incision is made through the pelvic and uterine walls to remove the infant. Coxal Bone is formed by fusion of three bones. Which of the following bones is not a part of the fusion ? The sacroiliac joint is formed by combination of which two bones ? A portion of the pubis extends posteriorly to fuse with which bone ?